The tone on this half is very attractive it starts on the lower right side (between 3 and 6 o'clock) with a deep blue crescent around the rim. Then it goes into a light purple for the rest of the coin except for "IBER" is white, the reverse is white also. 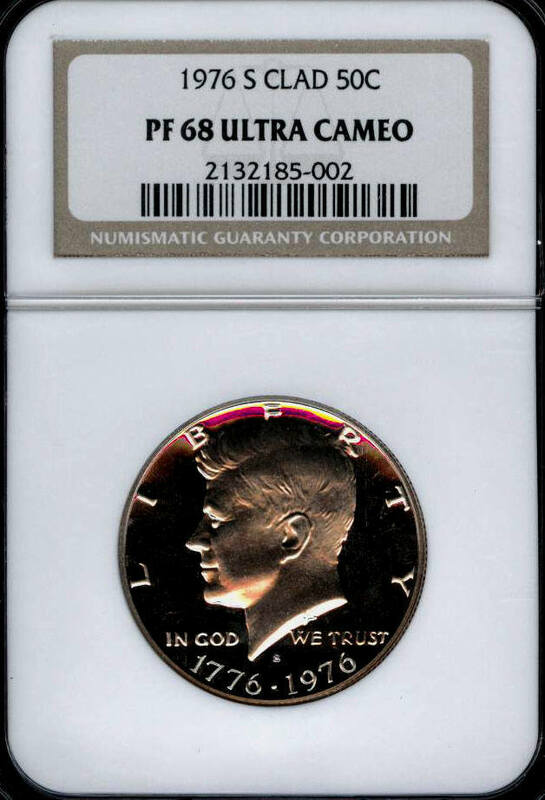 A pleasing example of a certified toned proof coin. 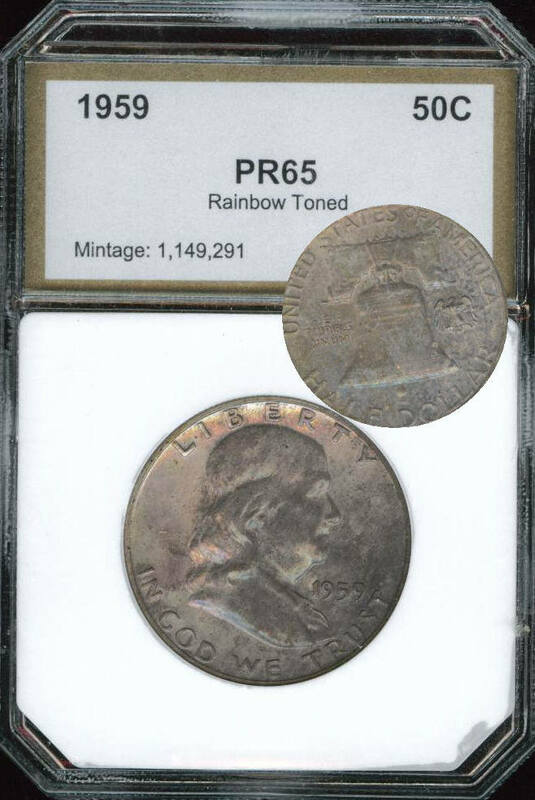 This one was graded by PCI as proof 65 rainbow toned. It has 2 sided tone and rainbow of color shows up when you move it around in the light. 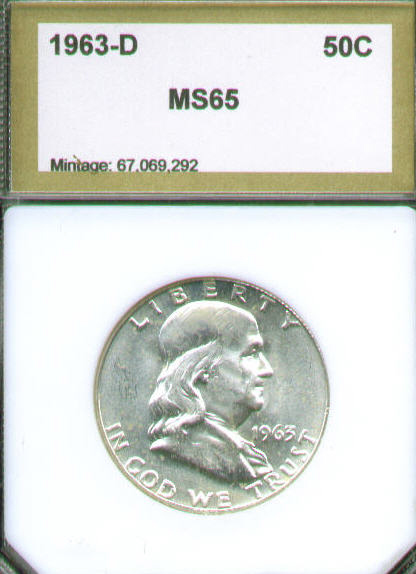 Next up we a franklin half dollar in Mint State 64 grade. 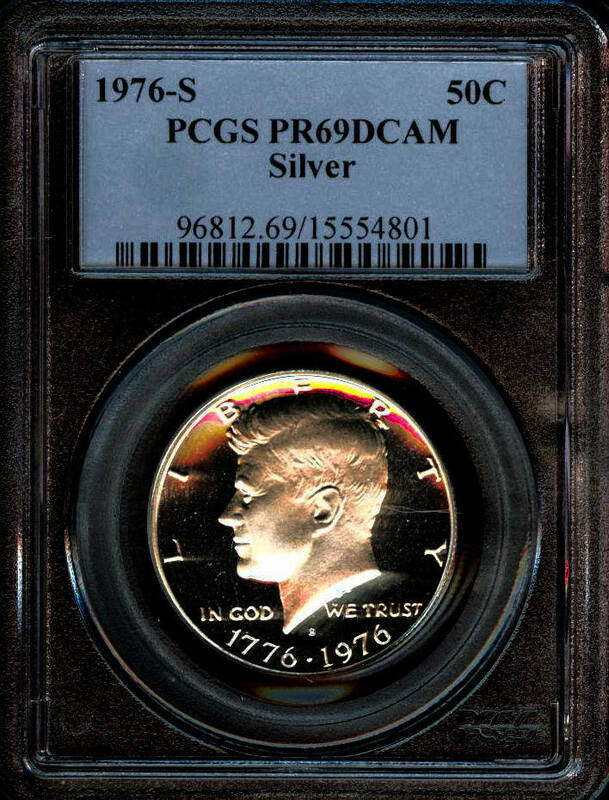 The obverse has nice brush strokes of light tone with silver luster shining through. The reverse is bright white. Starting at the top of the coin and going down we have blue/violet, then purple then orange and ends at the bottom with golden yellow and streaks of silver luster bursting though. 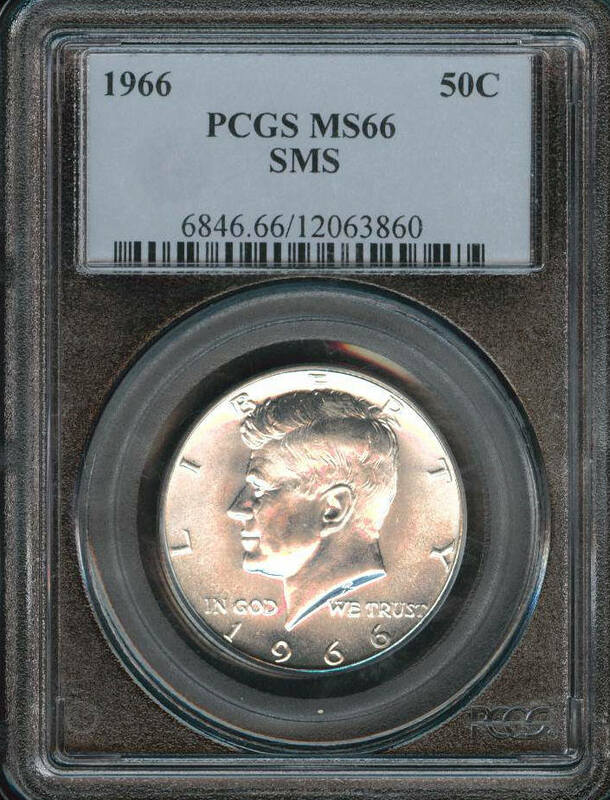 Reverse is mostly white, NTC gave this beauty a MS65. 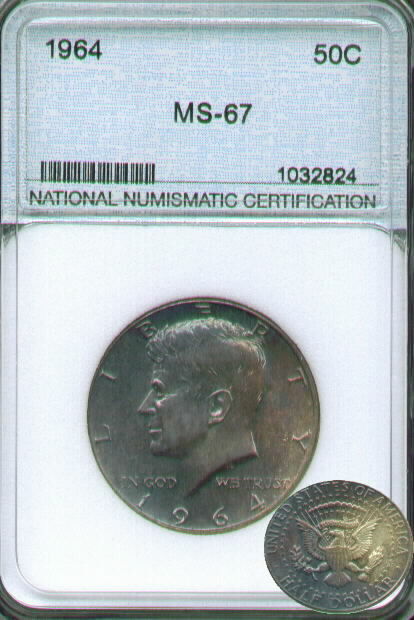 Next we have a 1961 silver Franklin half dollar certified by NTC. 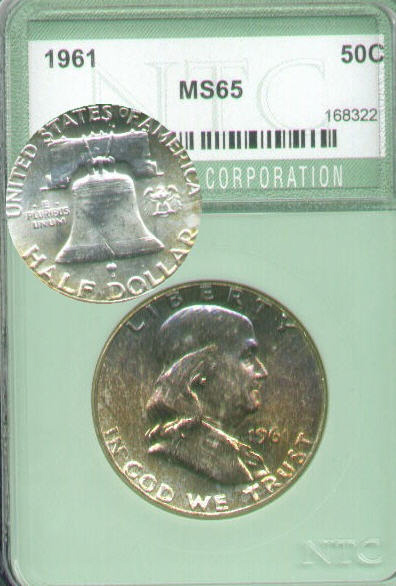 This silver franklin half dollar is graded Mint State 65. 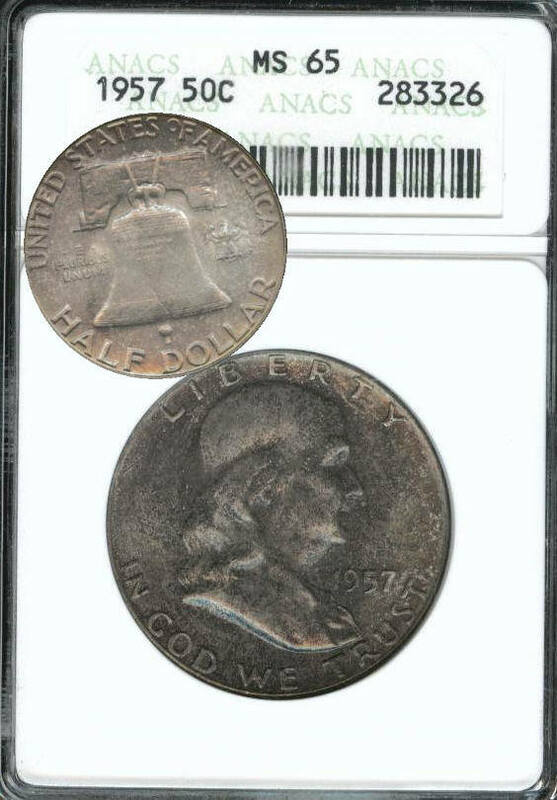 Here we have a beautiful Franklin toned on both sides. 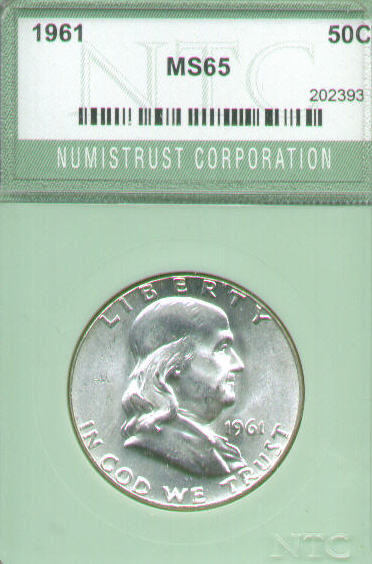 It is certified by PCI as Mint states 65. 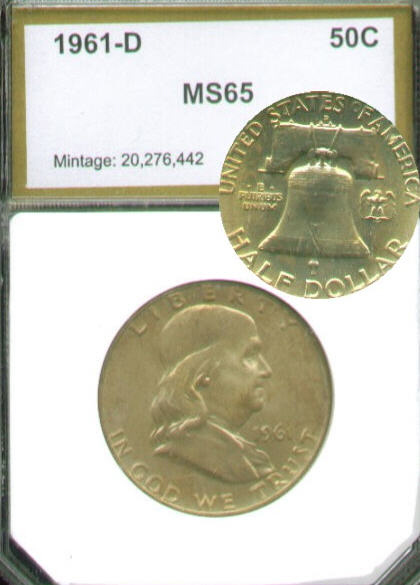 Coin World's Coin Values this coin at $175.00 Dollars in MS65. Here you can grab this at only $59.99. 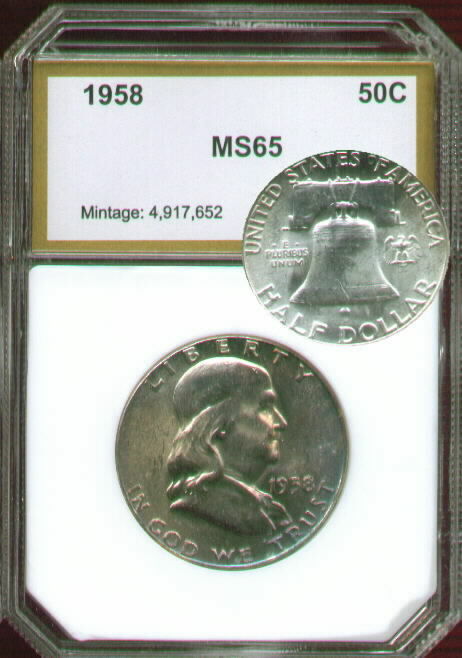 Same as the one listed above, except this one has very light tone on the obverse, a Denver mint mark and is graded Mint State 65. 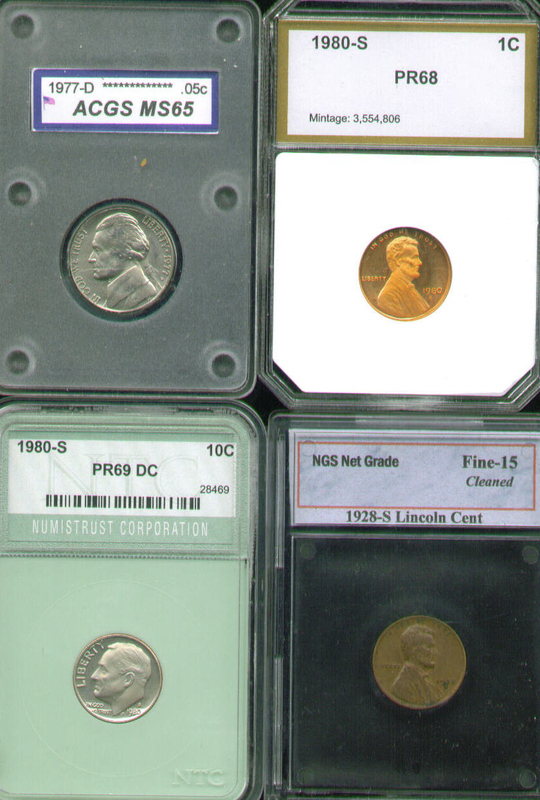 Since we put together a collection of 1963 franklin halves by all the certification companies we ended up with some duplicates. So here's your chance to get one cheap. This one is graded by SEGS. 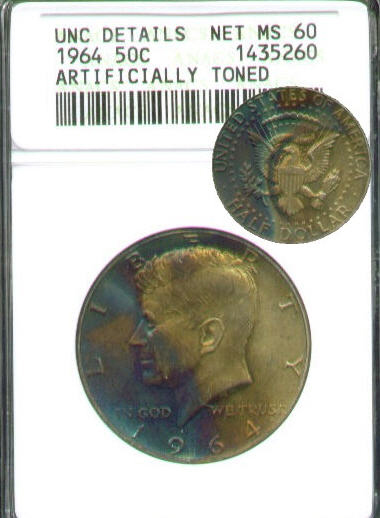 The toning on this coin is amazing I guess that was a dead give away that it has artificial tone. 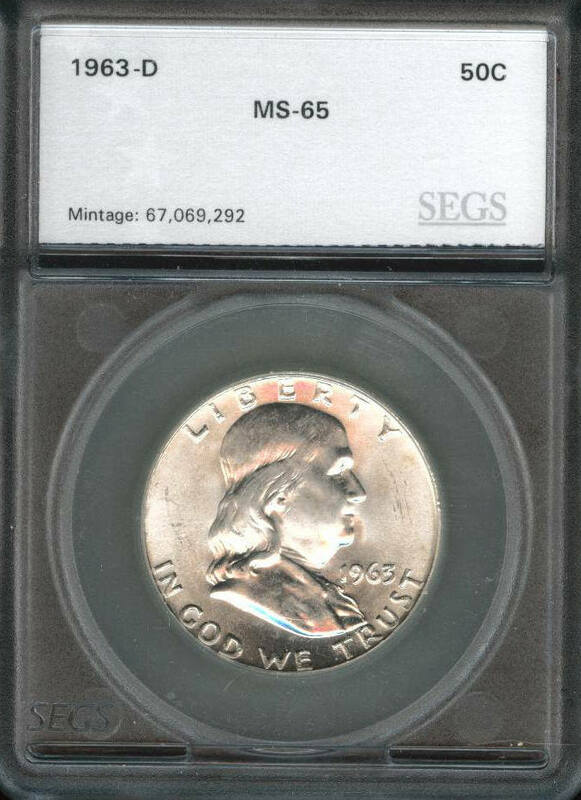 ANACS gave it UNC details with a net Mint State 60 grade. 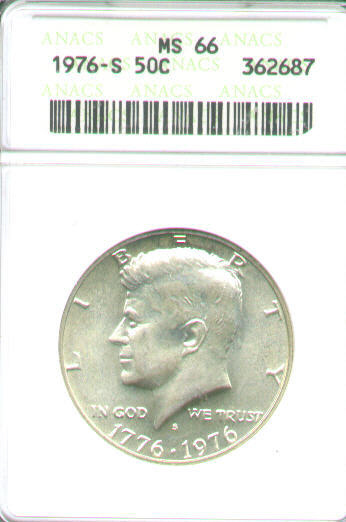 Here we have a beautiful 1964 toned silver Kennedy half dollar. Although the grade seems a little high because of a nick in the field, the toning makes up for it. 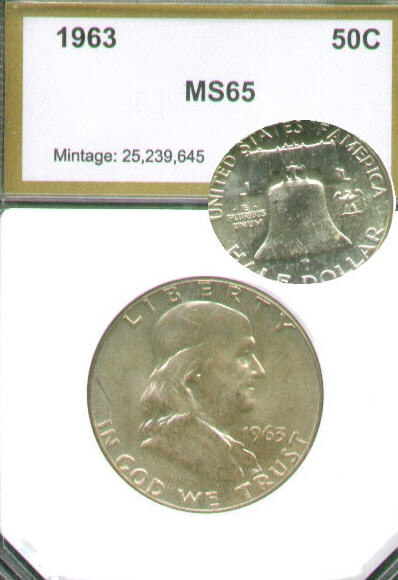 A true MS-67 is listed in Coin World's Coin Values at $450.00 Dollars. 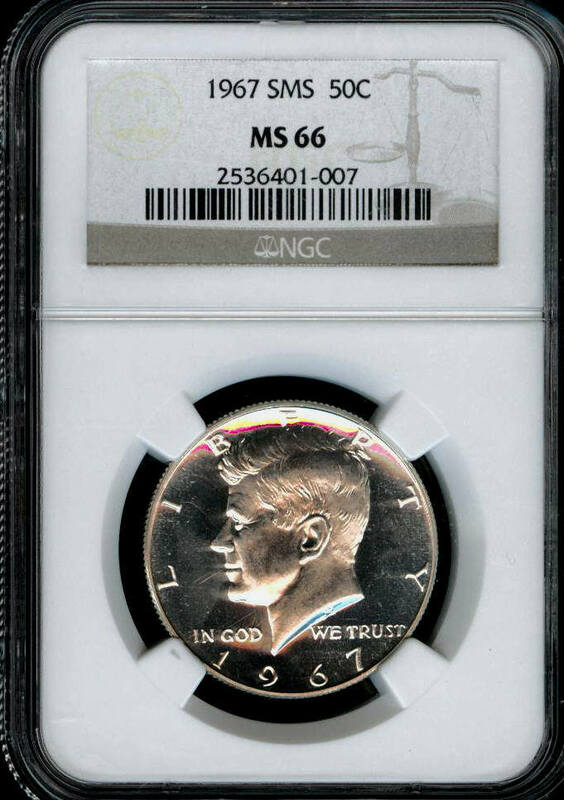 After the mint started production on the 1964 Kennedy halves, one was presented to Jackie Onassis at which time she said the hair was wrong. 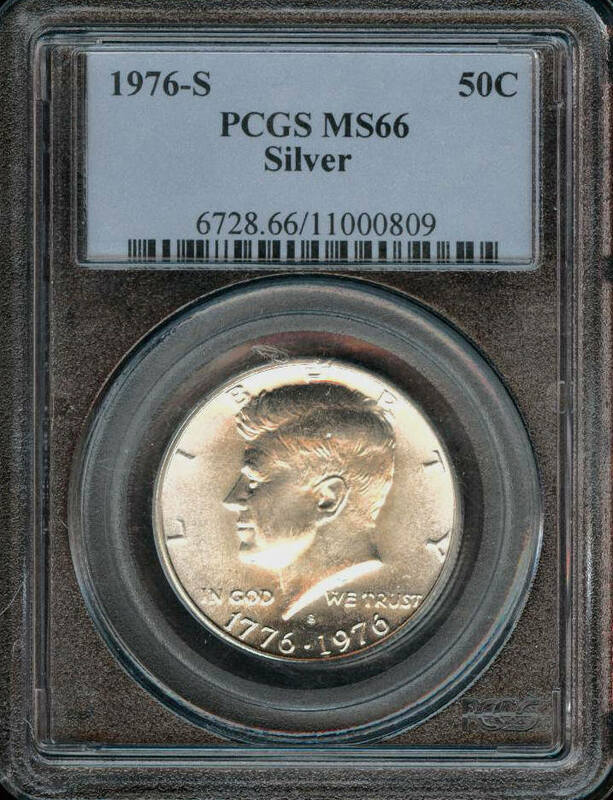 So the US Mint changed the design in mid stream. 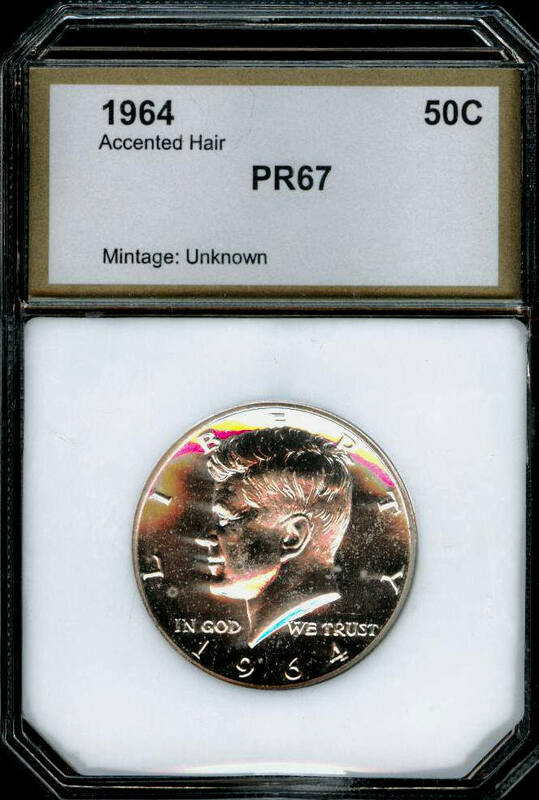 According to most authoritative sources, the accented hair variety is only about 1% to 3% of all 1964 proof Kennedy halves. We have a couple examples listed below. 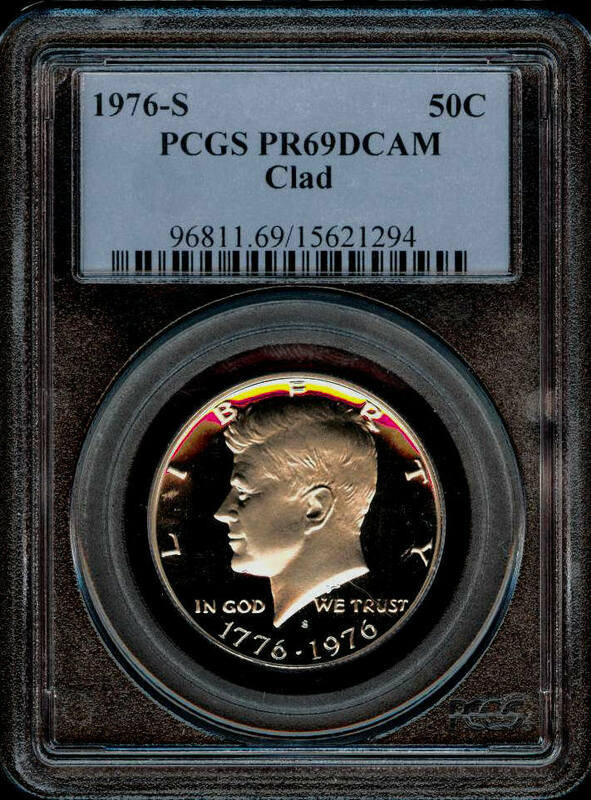 Although PCI gave this a whopping Proof 67 it does have the common white milky spots that plagued the 1964 half and therefore we feel it does not have the eye appeal of a PF67 coin, so we are dropping this to only $79.99. 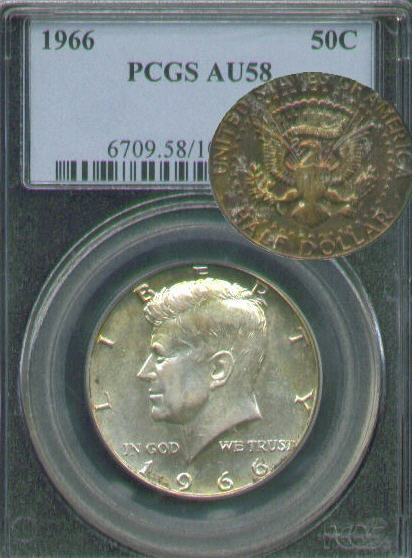 Here we have a beautiful 1966 toned Kennedy half dollar. 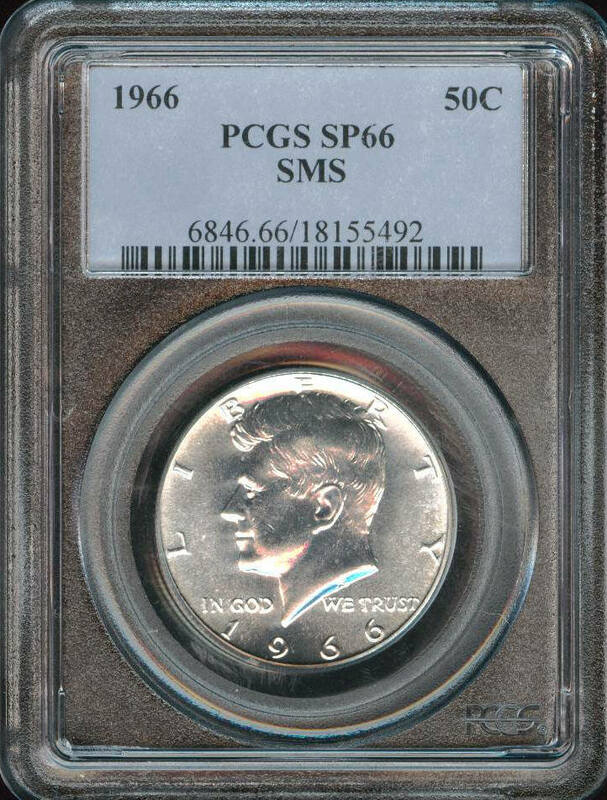 This amazing toned coin is authenticated by PCGS so you know it's original tone. The reverse is saturated with every color in the rainbow. Even the OBV. has a lighter colored rainbow. 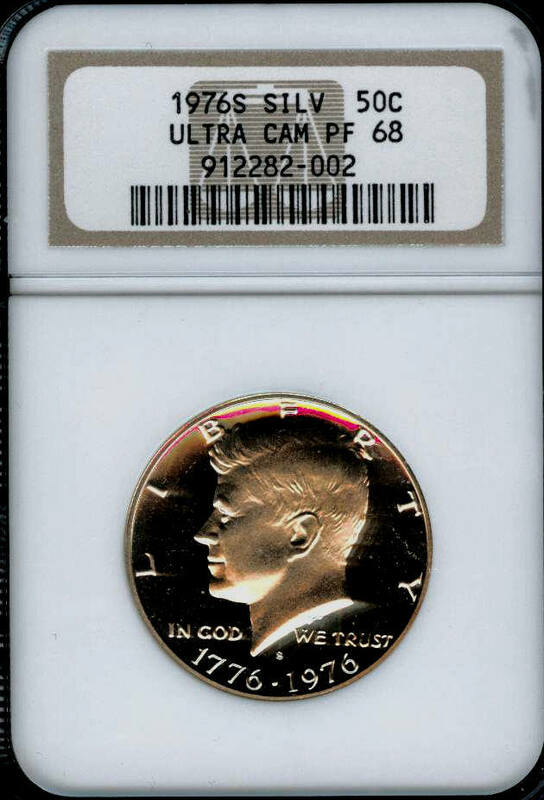 A pleasing example of Special Mint Set kennedy half. 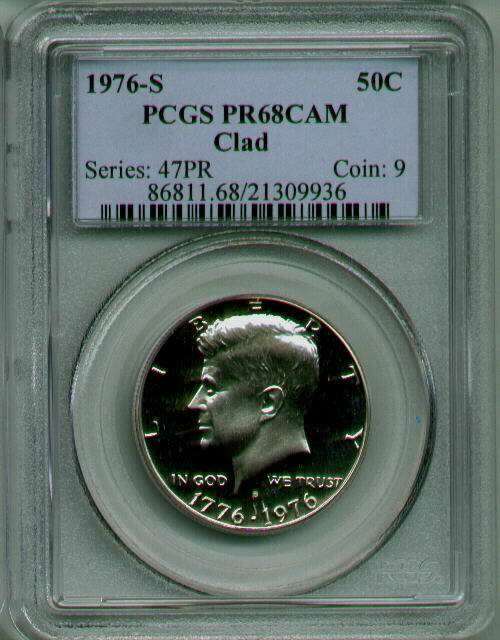 PCGS grades this as SP66 which must mean Special Proof 66.
same as the one listed above although this one is in an older holder so it was graded MS rather then SP. 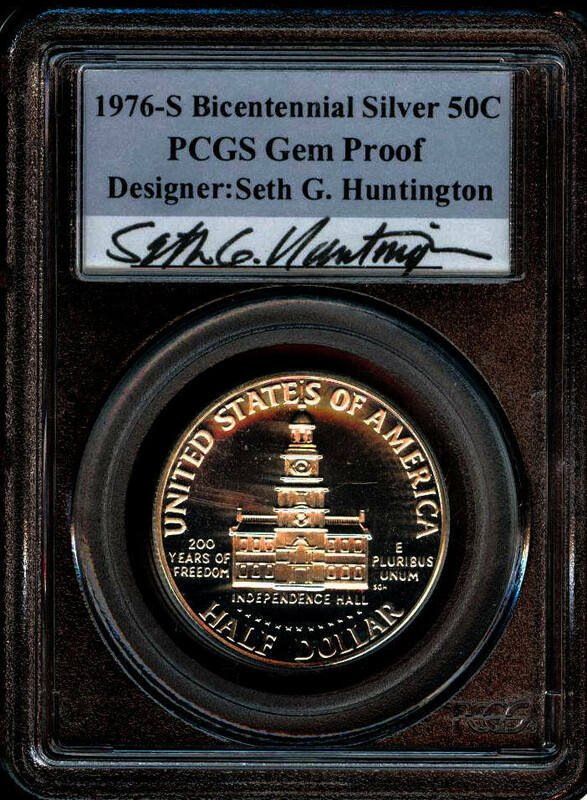 This Bicentennial half dollar is certified by one of the oldest certification companies on the market. 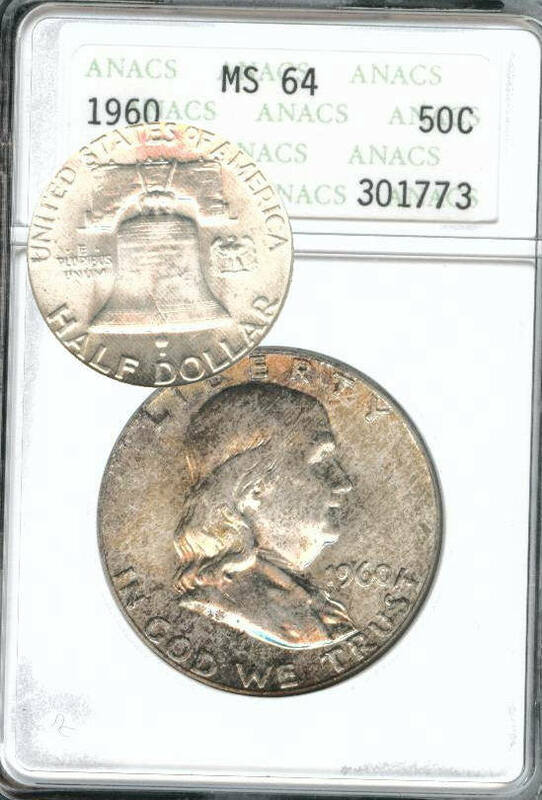 ANACS gave this frosty white silver half dollar Mint State 66. 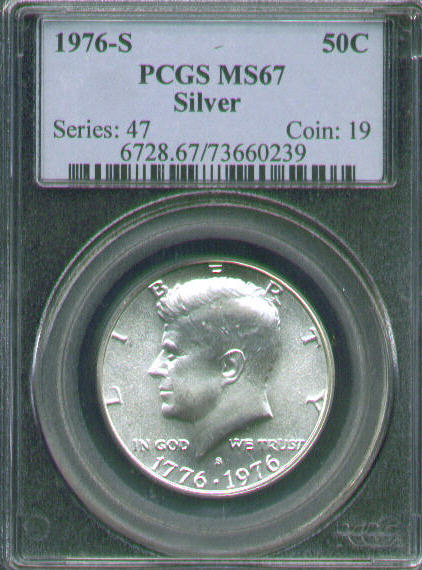 Here we have a Bicentennial half dollar graded and slabbed by PCGS. This is a Mint state example with bright white mint luster and a razor sharp strike.